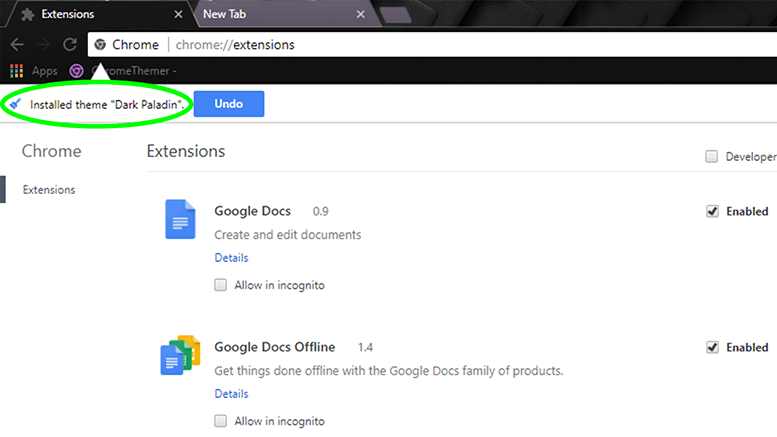 Installing your new chrome theme or adding your chrome extension can be as easy as dragging and dropping the .crx file into the extensions page within your chrome web browser, or if you have access the source files of the theme or app you could also manually add it using this method. The third and most effortless way you can install chrome themes is offcoarse to download your theme directly from the web store... Theme developers often use the method described below to test themes and other chrome extensions before uploading to the web store for you to enjoy! 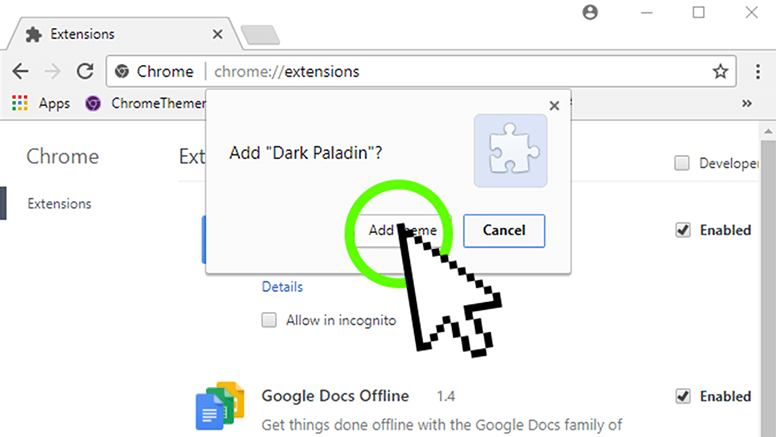 This will very simply open the chrome extensions page for you. Once you have that page open you can minimize the window and move on to the next step. 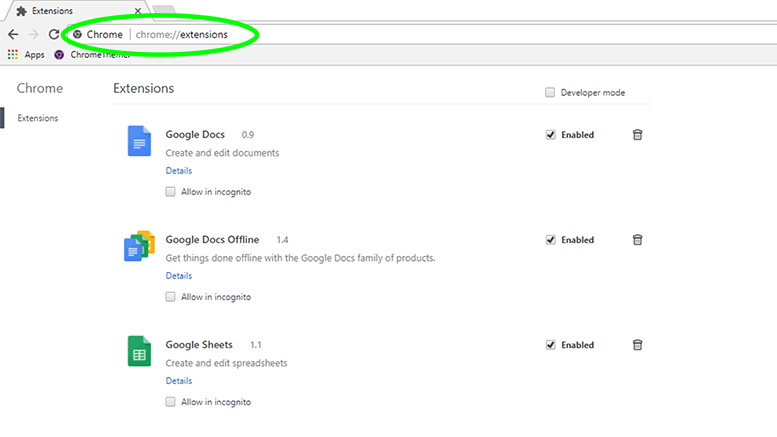 You should now see the "Extensions" Page open up in a new tab or new window depending on your personal settings. 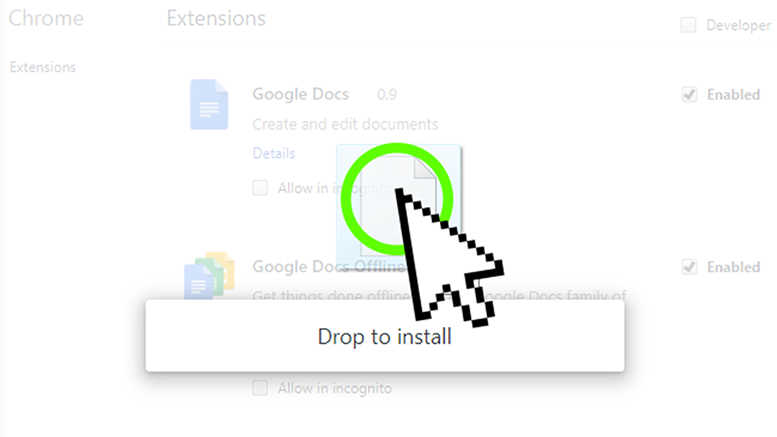 On this page you will see all the chrome extensions you currently have installed. 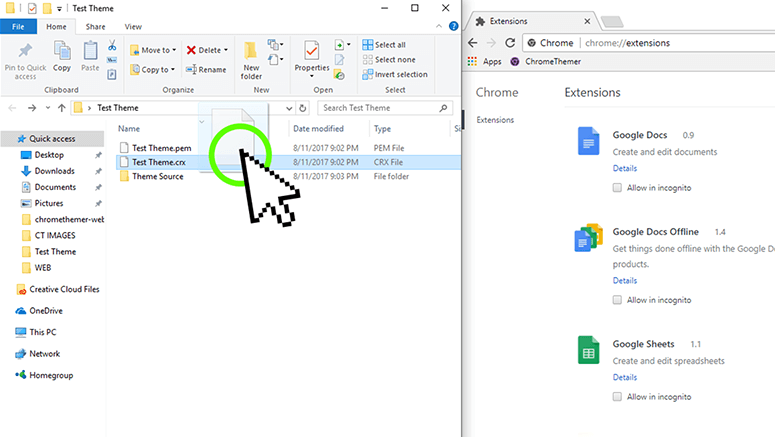 Minimize your browser window and simply drag your .crx file into the chrome extensions page. Simply Drag and drop the ".crx" extension file onto the Extensions page from the source directory. You will need to know where to find your .crx file. If you downloaded our packaged .zip theme file the .crx file you are looking for will be inside that folder. You can drag the .crx file from wherever you have it stored on your computer. Basically wherever you have the the .crx file stored on your computer, Most likely in your downloads folder. 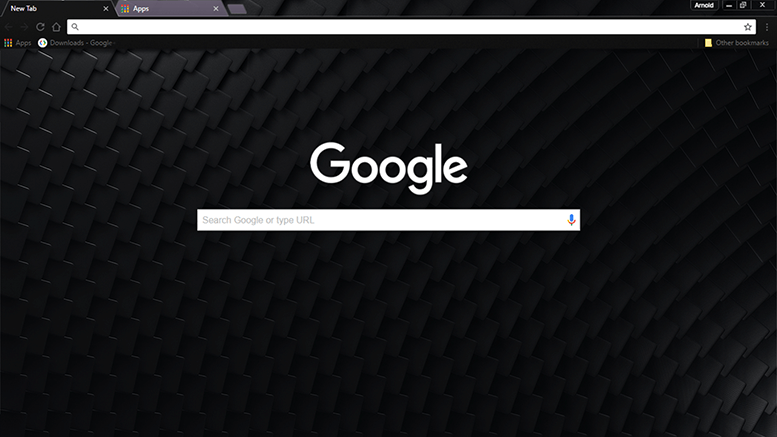 Click on the "Add Theme" button that will now appear on your screen to install your new chrome theme. There will also be a "Cancel" button, though hitting that would totally defeat our objective at this point. 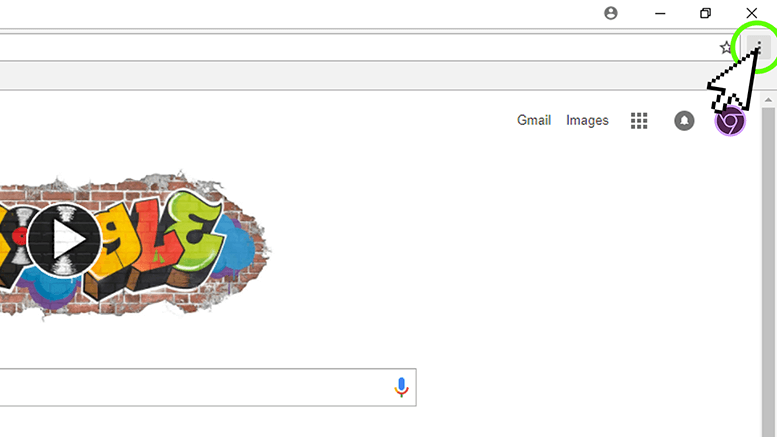 You can now confirm that your new theme or extension is successfully installed in your chrome browser and click on the close tab to close the banner if you want to... Quickly click on a new tab to view your theme &...Presto! your new theme is installed. ***Please Note***; If you click on the "undo" button your browser will be reset to it's default theme. 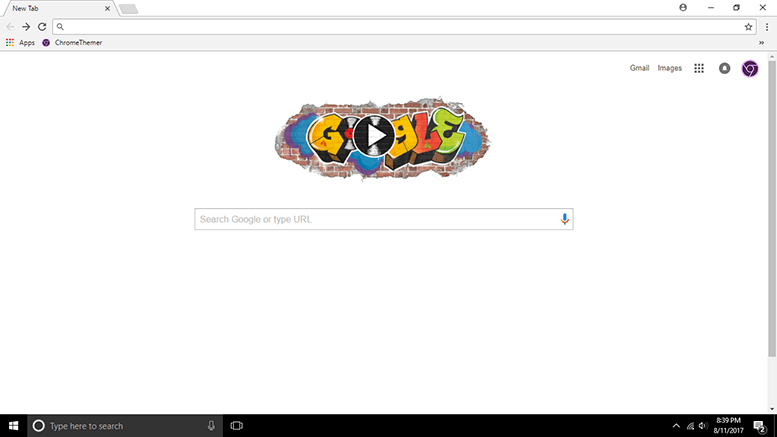 Now you can be amazed and enjoy your brand new google chrome theme, browsing happily for some time to come. It's so simple and easy to download and install themes or extensions, whether you use the .crx file to manually upload your theme or simply want to test your new theme or app, this truly is the best and easiest method you can make use of. 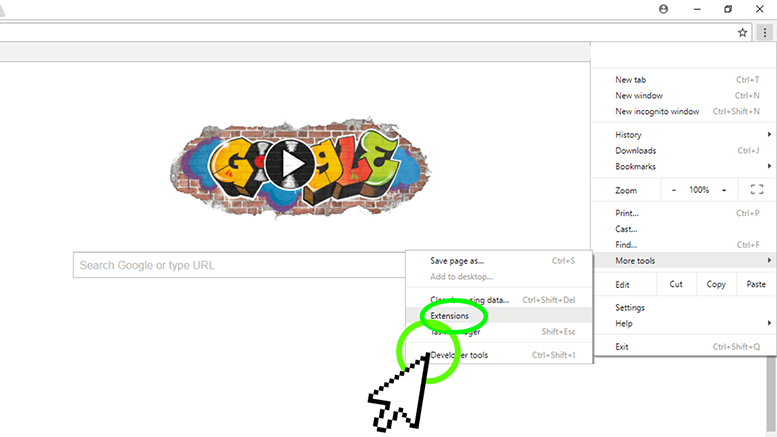 Inside your browser quickly navigate to Settings-Icon> Move down to Tools > & Click on Extensions.